The stock market is a tool and mechanism to create wealth for working professionals and the whole mass who want to create money. However many times market usually acts as jitter and make your Experience bitter. Finally, it’s up to you how you can turn it into glitter especially this Diwali. Want money making tips without indulging your Diwali Holiday? Sit back and Relax! Our Research Analysts of Investelite Research are here to serve as Market Pandits who will deliver share market tips with lighter risk in accordance to the fluctuations in the market. 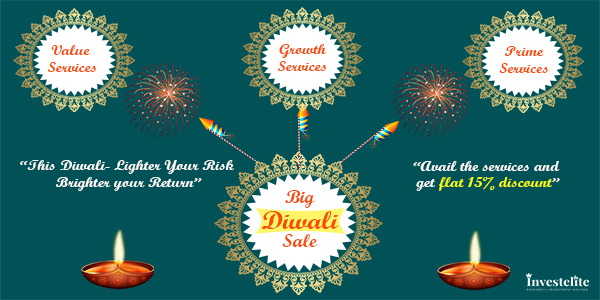 Our Research Analyst will keep a constant tab on various market trends, they do research and analysis to identify the behaviour of stocks and risk assessment and especially on the auspicious occasion to make your return brighter this Diwali. What benefit do you get from our side? Avail the services and get flat 15% discount on all share market tips that are being provided by our experts. From past few days, the market is showing anonymous behaviour and escalates shares value in a couple of minutes. Definitely, in such scenarios trader require financial planner who can study fundamental and technical aspects to make your Diwali Safe. We are here to serve you the effects in share market before and after Diwali, past records of Diwali effect in the market, how to trade during Muhrat session and the recent scenarios which may affect your trading. What measures and metrics we apply for brighter return? Through appropriate stop-loss policy our Research Analyst measures to reach the target. Investelite Research primary motto is to Research in silence, to let your maximum return to make noises.